What? You think just because Erin is on vacay this week that we can’t have any fun? 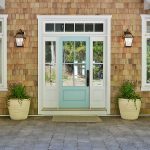 Pack away those turquoise tissues (though we do miss you, Erin) and get your aqua luggage in the station wagon… Vivid Hue Home is taking you on an adventure. 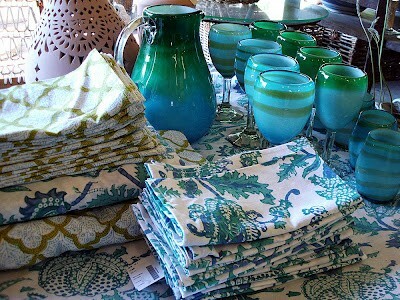 (Oh, by the way, you may remember me for my sun room tour that House of Turquoise so graciously featured). After all, this is a holiday week for many people which means picnics, barbecues and fabulous feasts. 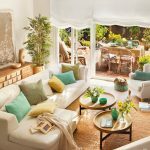 Rather than gallivanting off to some exotic, far-away place, I thought we’d explore dining spaces that would serve as perfect hosts to your fourth-of-July celebrations no matter where you are hosting the gig. 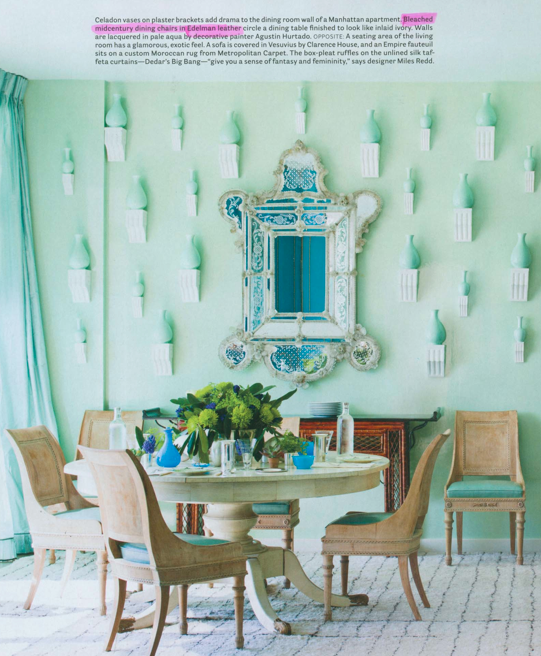 New York City based designer, Miles Redd, designed this serene dining area. How perfect for a casual yet elegant affair with a few of your closest friends. This NYC apartment boasts terrific views of the Hudson river, sure to be a crowd pleaser for watching the city fireworks. Take the party outside, Napa-style. 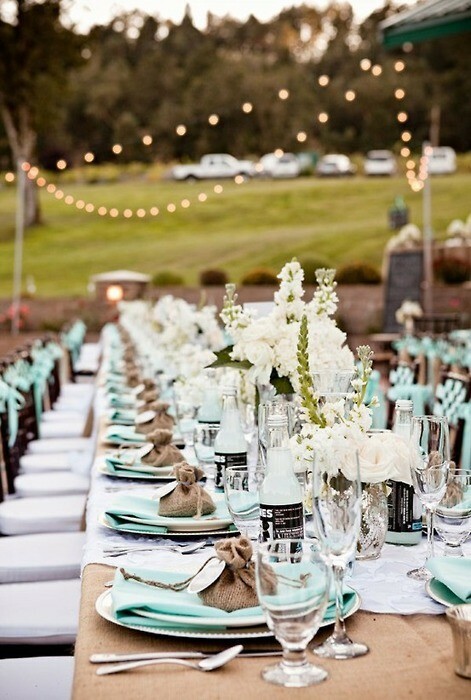 Turquoise becomes the perfect accent to a burlap and farm-to- table style celebration. Drink a little vino, draw ‘sky art’ with sparklers and make memories with your besties. 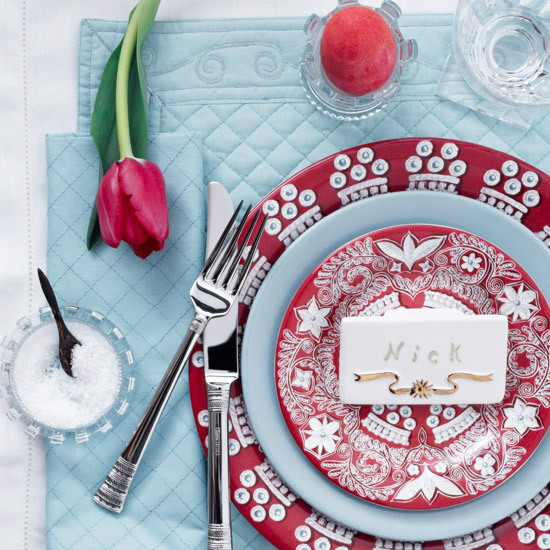 Why not add these ultra bohemian-chic accents to your table? When I initially discovered Roberta Roller Rabbit, I thought I’d died and gone to Heaven. Her designs include a collection of hand block printed fabrics, a craft perfected over hundred of years by artisans in India. Maybe you’re feeling a little more like a ‘Golden Girls’ celebration this week. You know, a little Palm Beach, Florida in the sixties? 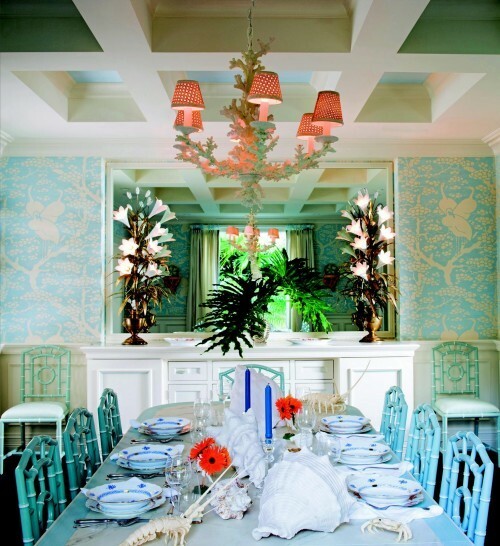 Sure, there’s the fun banana leaf decor— but why not retreat to turquoise bamboo chairs and a coral reef chandelier. Your guests are sure to feel exotic! Whatever the case, I hope you’ve enjoyed your journey with Vivid Hue Home. My philosophy is that you should have fun with design. Don’t be timid to mix and match patterns and styles. Use color. Mix antique with modern, flea market with new. Have fun. Show your personality. You can’t go wrong by doing what feels right. If you feel the same, please pack those bags and give me a visit. You’re welcome at my house (tour) any time! Enjoy a safe and happy fourth-of-July week! 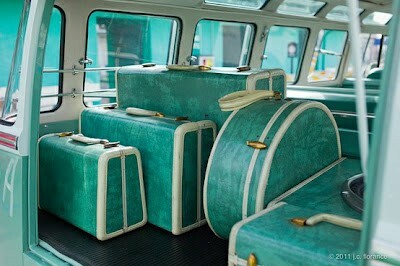 I would like that luggage please!!! 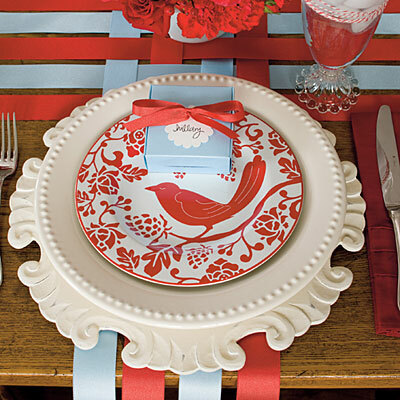 Gorgeous table settings! 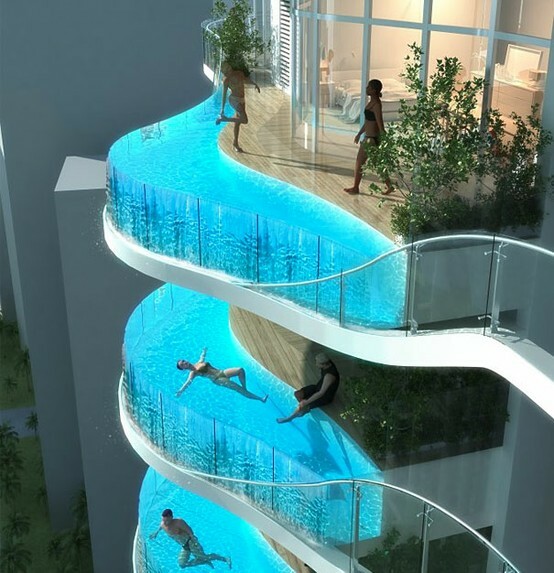 And I think it would freak me out to swim in those pools, but it looks amazing! Fabulous 4th ideas and images Heather! Thank you for the inspiration! Thank you all for the wonderful comments and support! Great post! Those pools are scary-beautiful! Turquoise and red? Who'd have thought they look so fab together! Lovely pics. Have a great 4th! Love your blog, view it everyday. Just joined. Have a Happy 4th! 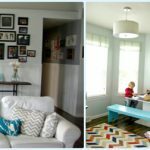 What a wonderful guest post. 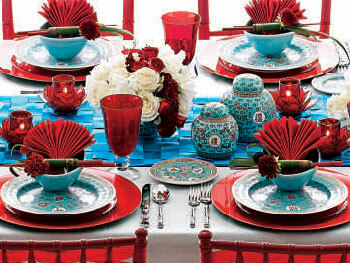 Love the tablescapes. This is so cheery. great stuff, heather! 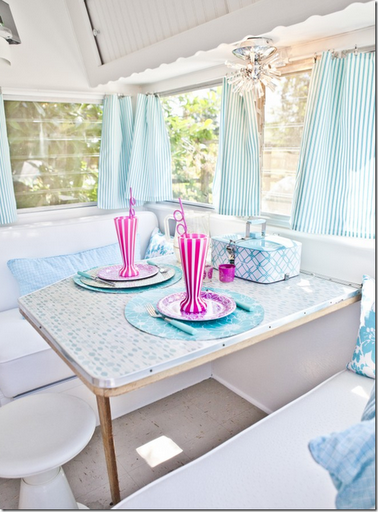 love the block prints and the turq and tan outdoor dinner table.